Mark is a noted specimen coarse angler, and a fly angler who also turns his hand to sea fishing. Mark has been lucky to fish not merely in the UK but across five continents. 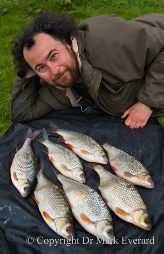 He is a regular contributor to the angling press (including a regular column in Waterlog) as well as an author of nine books on fish and fishing. Mark continues to contribute to fishery conferences and to various public meetings and presentations. Mark maintains a blog on his fishing and fish-related activities; have a look and see what’s new! Mark’s done a of TV and video. Someone has uploaded on YouTube a video produced by Steve Lockett of Mark winter trotting for roach and chub on the Bristol Avon.